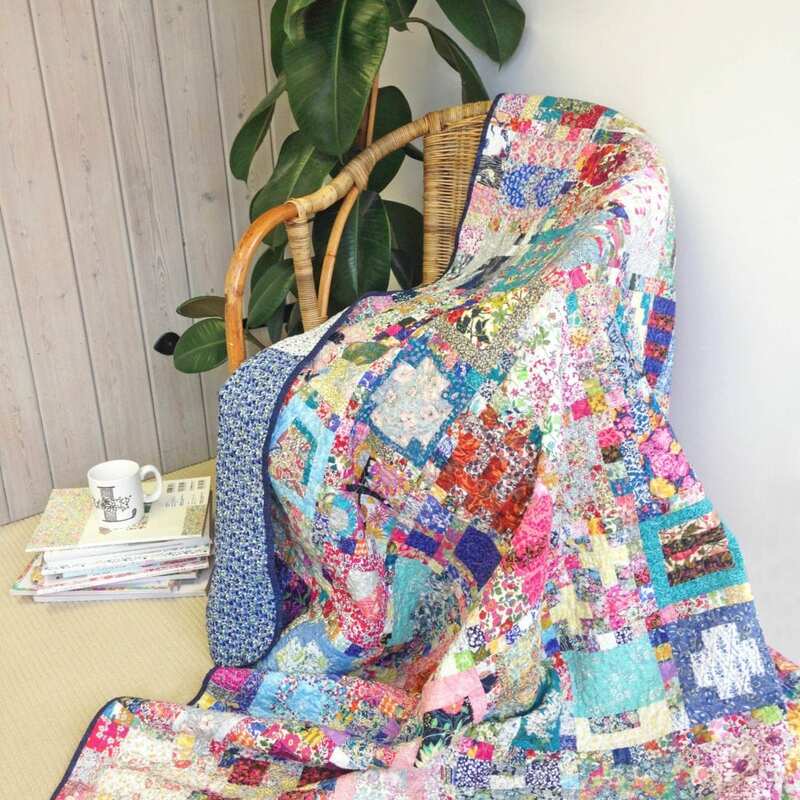 One of my customers, Lisa Perry, has made this gorgeous Liberty Quilt. It was inspired by the Gnome Angel sew along and uses Tula Pink designs from her book ‘100 Modern Quilt Blocks’. I love the gorgeous mix of Liberty fabrics in this quilt. It’s so vibrant and fun. Lisa came in to the studio a few weeks ago with this beautiful Liberty Quilt. Everyone gathered round (as is traditional here) to see what Lisa had brought in. I couldn’t resist taking a few pictures and sharing her quilt story with you. I asked her a few questions about the quilt. 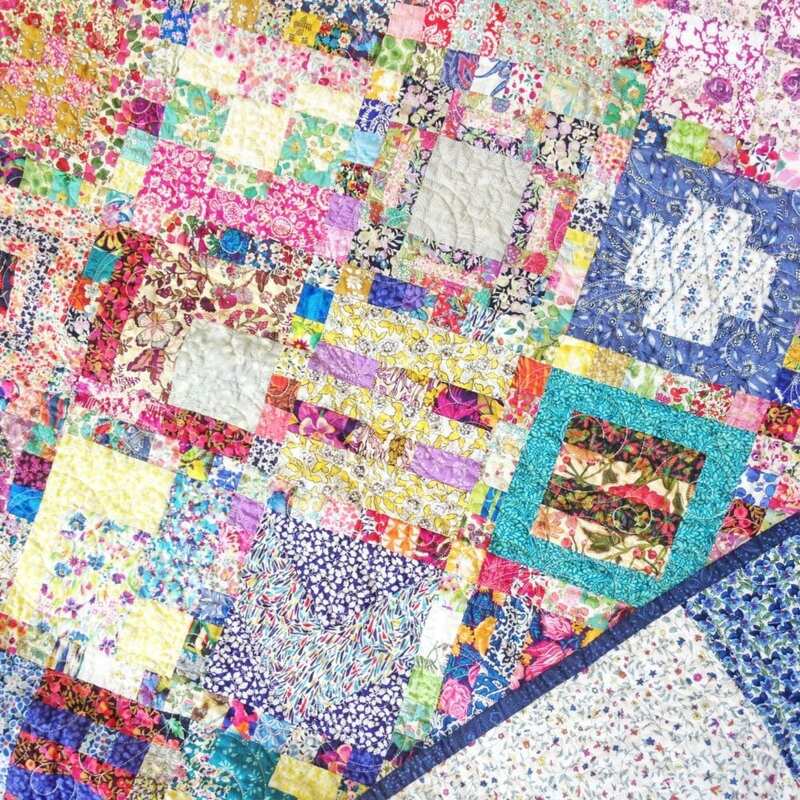 What inspired you to make the quilt? 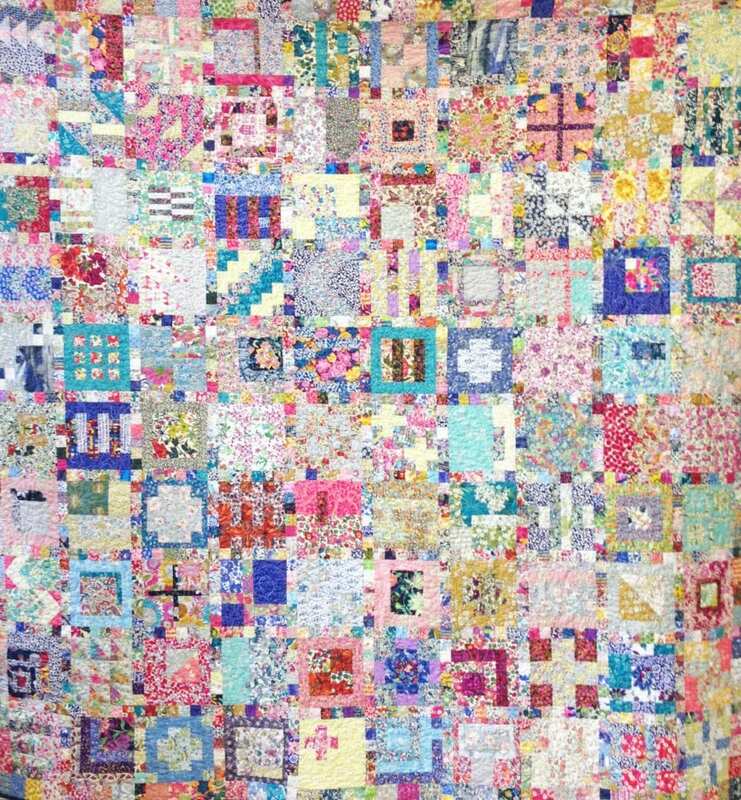 I was inspired to make the quilt from a handful of Liberty scraps that I had. I wasn’t sure what I could make with them and had a search on Instagram. I came across lots of beautiful quilts on my search but they looked too complicated for me to make. I eventually came across a sew-along being hosted by Gnome Angel and it was called 100 blocks 100 days. The challenge set by Gnome Angel was to make every block in the Tula Pink, City Sampler 100 Modern Blocks book and post them daily on Instagram. I followed the instructions in the book and was hooked on making the different quilt blocks and I loved picking out Liberty fabrics to use for each one. How did being part of the sew along help you feel part of the wider sewing community? I loved doing the 100 block challenge on Instagram. Straight away I was receiving messages from fellow quilters all around the world, offering lots of encouragement along the way. I don’t think I would have completed the challenge without the lovely quilty friends I made along the way. I love your quilt and think it’s completely stunning – which is your favourite part of the quilt? Thank you!!! I think my favourite part of the quilt is the Liberty fabric. I love it and have quite a collection now. I never realised how well the different Liberty prints just go together. There is a mix of vintage and modern, along with just about every colour imaginable. The prints also have so much hidden detail, which I adore. What are you going to use your quilt for? The quilt is already in use on our sofa. It’s perfect as it’s a nice big size and gets used often. 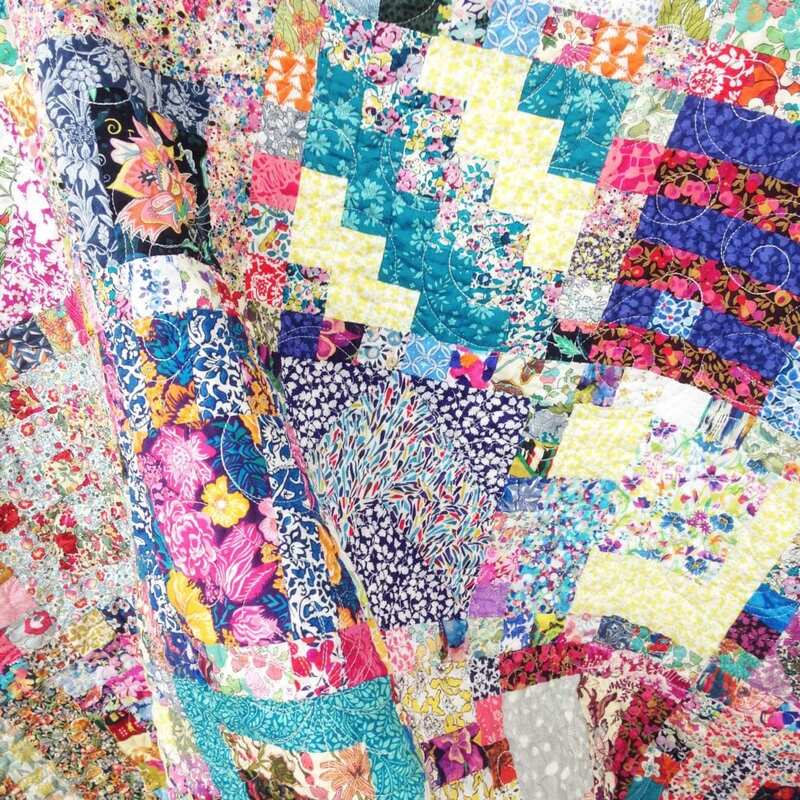 I’ve noticed that you have used on of our Liberty vintage fabrics to back the quilt – what drew you to this fabric? I loved the vintage Liberty prints that you had and immediately fell in love with the blue viola print. I bought a piece and popped it in my stash, not quite sure what I was going to make with it! When I came to back my quilt I totally got the measurements wrong and remembered I had the viola print. It looked perfect next to the other Liberty print and I love the mix of vintage and modern. You can see a hint of the viola vintage Liberty fabric in the picture below. You’ve also made a Quilt SOS quilt for our project this year – thank you so much! What inspired you to get involved with the project? I made my first SOS quilt last year and it ended up being the first quilt I finished. It is a great project to be involved with and I was really excited to join in again this year. I am so chuffed that the skills I have learnt since I started quilting can be used to make something which is not only useful but hopefully a comfort to a child who has so little in their life. I loved reading about your journey to the SOS village last year and how much excitement it gave the children to have their own quilt. I can’t wait to hear about this years trip too! Thank you Lisa for being an amazing Alice Caroline customer and sharing the story of this lovely quilt with me.